The worst thing about Mario Batali mentioning Hitler, Stalin and bankers “in the same breath” (“After Chef’s Hitler Remark, Bankers Change Lunch Plans, NYT, 11/9/11) is the reminder that Time Magazine voted Hitler and Stalin Men of the Year in l938 and 1942 respectively. It’s also a reminder of what Time once was, a part of the fiefdom of the conservative Henry Luce. 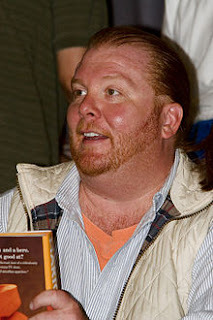 According to the Times, Batali’s problems began when he joined a panel of movers and shakers including Brian Williams, Anita Hill and Jesse Eisenberg to publicize the “Person of the Year Issue.” Ordinary folk who want to unload their piggy banks to get into redoubts like Babbo and Del Posto will now find it that much easier— now that Wall Street is twittering itself hoarse You’d have thought Batali were Joe Paterno or worse Jerry Sandusky the way the gang who brought you credit default swaps, collateralized debt obligations and John Corzine indignantly responded to being compared to tyrants. How can you compare selling someone securities that you yourself are betting against to the kind of atrocities perpetrated by Stalin and Hitler? The answer might be found in digging out your previous issue of the Times with its piece on the atrocitologist Matthew White who has written a book entitled The Great Big Book of Horrible Things: The Definitive Chronicle of History’s l00 Worst Atrocities. Truth be told Batali himself was contrite. The Times quoted a statement issued by one of his spokes folks in which he said, “It was never my intention to equate our banking industry with Hitler and Stalin, two of the most evil, brutal dictators in modern history.” How can Batali expiate his sins. Like Lindsay Lohan, of course, by working in a soup kitchen.